LA burglar Junior Bender has (unfortunately) developed a reputation as a competent private investigator for crooks. The unfortunate part about this is that regardless of whether he solves the crime or not, someone dangerous is going to be unhappy with him, either his suspect or his employer. Now Junior is being bullied into proving aging music industry mogul Vinnie DiGaudio is innocent of the murder of a nasty tabloid journalist he'd threatened to kill a couple times. It doesn’t help that the dead journalist’s widow is one pretty lady, and she’s trying to get Junior to mix pleasure with business. Just as the investigation is spiraling out of control, Junior's hard-drinking landlady begs him to solve the disappearance of her daughter, who got involved with a very questionable character. And, worst news of all, both Junior's ex-wife and his thirteen-year-old daughter, Rina, seem to have new boyfriends. What a mess. Timothy Hallinan is the Edgar- and Macavity-nominated author of thirteen widely praised books, including "The Fear Artist," "Crashed, Little Elvises," and "The Fame Thief." After years of working in Hollywood, television, and the music industry, he now writes fulltime. He divides his time between California and Thailand. "Could not stop laughing. Tim Hallinan is sharp as a blade, has a wicked eye for human nature and keeps the reader guessing and rooting for Junior Bender all the way." "Hallinan introduces us to a drugged-out, pain-impervious hit man, a nonagenarian puppet master who rules the L.A. underworld, a tabloid reporter who uses his job as a cover to blackmail the rich and the famous, and a host of other characters as dangerously outrageous as the murderous crew obsessed with obtaining the black bird in Hammett's 1930 masterpiece." "Every now and then a writer comes along with the imagination and skill to make the whole thing feel fresh and new again. That's what veteran crime novelist Timothy Hallinan has accomplished." "A well-drawn cast of quirky characters, witty dialog, and a fast-paced and funny plot make this crime novel nearly impossible to put down." "Laugh-out-loud....'You want to be funny,' says one of Junior’s sidekicks, 'hire a writer.' For that, Hallinan’s your man." "The first book in the series, 'Crashed' (2012), was great fun. The new one, 'Little Elvises,' is even better." "An intricate high-stakes plot [and] a compelling subplot." "As the story opens, Junior is in a fix, or rather, a bunch of them..."
"Featuring Junior Bender, full-time Los Angeles burglar and part-time private eye-style fixer for the city's criminal element." "If Carl Hiaasen and Donald Westlake had a literary love child, he would be Timothy Hallinan. The Edgar nominee's laugh-out-loud new crime series featuring Hollywood burglar-turned-private eye Junior Bender has breakout written all over it... A must-read." "Hugely,splendidly entertaining... Full of delightful characters, and dialogue that provides at least one good laugh on every page, the book is so hard to put down you’ll swear it’s been glued to your hands." "A hallmark of a Timothy Hallinan mystery novel are unusual situations and characterizations, and a whole lot of humor. "Little Elvises" is no exception." 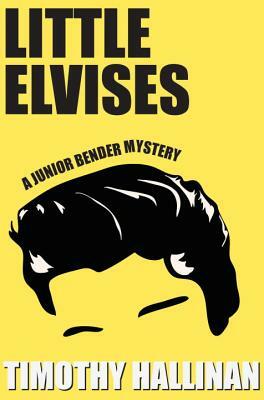 "Little Elvises begs comparison to Tim Doresey or Carl Hiaasen novels: It's quirky and hip, and often laugh-out-loud funny." "One thing that immediately hits you about Timothy Hallinan’s writing is the clarity and snap of his prose. Junior Bender isn’t a gumshoe, but the cadence of his voice and his observations harken back to other great detectives who were expert at landing a crucial, devastating remark, as well as using their fists or a pistol. It’s a cliché, of course, to bring up Raymond Chandler’s Marlowe, but the similarities are nevertheless present in fitting ways." "A nifty plot...[that] takes a surprising and satisfying twist in the final chapters." "If you enjoy the best of Lawrence Block or the capers that Donald Westlake wrote (or, not to be gendered about it, Bethany Maines! ); get a kick out of Los Angeles crime fiction like Raymond Chandler's; and appreciate a well-played hand of characters whose mistakes feel very, very believable, even though they're criminals and you're not (I hope!) ... then this is a series you'll enjoy." "A Hollyweird mystery that has more nuts than a Planters factory." "Junior Bender is today’s Los Angeles as Raymond Chandler might have written it. Tim [Hallinan] is a master at tossing out the kind of hard-boiled lines that I wish I thought of first." "Timothy Hallinan's The Fame Thief has everything I've come to expect in a Hallinan novel: indelible, complex characters, fantastic plot, and moments of hold-your-breath suspense." "Timothy Hallinan’s affable antihero, an accomplished thief but inept sleuth named Junior Bender, makes a terrific first impression in Crashed.... Bender’s quick wit and smart mouth make him a boon companion on this oddball adventure." "This is one of those books you long for, wait for, and find once or twice a year"
"Junior Bender is bound to be the topic of conversation amongst book lovers and crime fiction fans for a long, long time."